Greater Burdock is a biennial plant with crimson-violet flowers. The flower heads produce the famous ‘burrs’ that give Burdock its name. The plant is typically found on waste ground in cities, towns and the countryside. 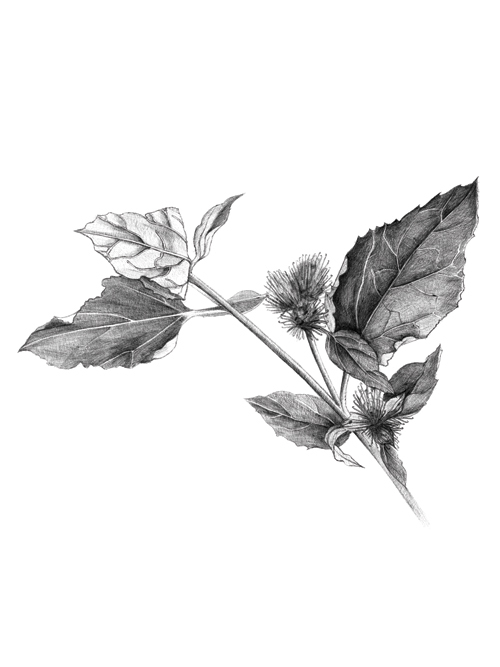 Greater Burdock has been used as medicine in China for more than 3000 years1. Its Latin name comes from the Greek word ‘arktos’, meaning ‘bear’, alluding to the roughness of its thistley burr. In Old English, the name for Burdock was herrif, aireve, or airup, derived from the Anglo-Saxon ‘hoeg’, a hedge, and ‘reafe’, a robber. Jones, P. Just weeds: history, myths, and uses. (Prentice Hall Press, 1991). Blumenthal, M., Ph.D, W. R. B. & Goldberg, A. The Complete German Commission E Monographs: Therapeutic Guide to Herbal Medicines. (Elsevier Health Sciences, 1999). Crellin, J. K. & Bass, A. L. T. Herbal Medicine Past and Present: A reference guide to medicinal plants. (Duke University Press, 1990). Chan, Y.-S. et al. A review of the pharmacological effects of Arctium lappa (burdock). Inflammopharmacology 19, 245–254 (2011). Barnes J., Anderson L.A., Phillipson J.D. Herbal Medicines.Third Edition. Pharmaceutical Press (an imprint of RPS Publishing): London, 2007; 102-104. Blaschek W., Hänsel R., Keller K., Reichling J., Rimpler H., Schneider G. (Hrsg.). Hagers Handbuch der Pharmaeutischen Praxis, Drogen A-K,Vol 5. 2thed.Springer: Berlin Heidelberg, 1998; 140-158. Final assessment report on Arctium lappa L., radix. European Medicines Agency 2011.